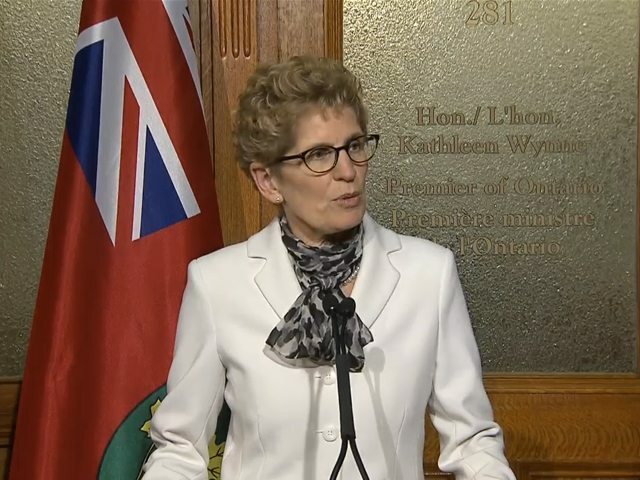 Minority Liberal government is dissolved after Premier Kathleen Wynne asks the Lieutenant-Governor to call an immediate election. Kathleen Wynne announcing the June 12 election. I have just met with the Lieutenant-Governor, and he has accepted my recommendation to dissolve the 40th Legislative Assembly of Ontario. The official documents will be presented to His Honour later this afternoon, at which time the House will be officially dissolved. On June 12, the people of the province will have a choice: they’ll have a choice between the balanced approach of a Liberal government that will create jobs and nurture our economic recovery, and the opposition party that would put recovery in jeopardy recklessly, with irresponsible choices. They’ll have a choice, in fact, between safe hands and recent tactics. I want the people of Ontario to know exactly what a Liberal government means. I’m working to create opportunity for all. I’m working to create jobs, I’m working to create growth, and I have the strongest team. As a province we’ve gone through some tough times together—there is absolutely no doubt about that. The global recession hit us hard. But our recovery is taking hold: it’s taking hold steadily, and it’s taking hold persistently. Companies are hiring again, confidence has begun to rise, we’re finding our footing, we’re on our way back. But we cannot put that at risk. We need to move forward with a steady, balanced approach—we can’t veer off to the left or the right. We can’t risk that. My government has a clear plan to help create more good, well-paying jobs in Ontario and to help young people find that all-important first job. We have a clear plan to invest in infrastructure and in transit so that our province becomes an even better place to live and work and raise a family. We have a clear plan to invest in our people with skills and development training, to help them find work and then to keep them in that work and help them get ahead in that work. We have a clear plan to help Ontarians save for retirement, so that the reward for a lifetime of working hard is a secure retirement, not a struggle for survival. I’ve been premier for only a bit more than a year now—I’m still new a new face to many Ontarians, I know that. And I want them to know this about me: I believe that there is only one good reason to enter politics, and that is to help people. And you do that by making government a force for good in people’s lives, a positive force, a progressive force—helping to create jobs, helping our kids to get the best education, putting in place the conditions to help people and businesses to thrive. We talk a lot about the economy but for me it goes well beyond the numbers on a page, it goes beyond statistics and forecasts. It goes to the very heart of who we are. It’s about the well-being of people in Ontario: our families, our friends, and our neighbours. Here’s the reality: the decisions that are made by the next government of Ontario will make a huge difference in people’s lives. Those decisions will change Ontario, and that change can be for the better or it can be for the worse. Those decisions that change will matter to the people of Ontario. They will matter to every individual and to their families. If Ontario’s future is entrusted to an NDP government, that will make a difference in people’s lives. We’ll be burdened with reckless financial decisions and a hostile attitude towards business at a time when Ontario needs growth in jobs and partnerships with business. The NDP doesn’t have a coherent plan to do that. They make pie-in-the-sky promises but they won’t say how they’ll pay for them. So now is not the time for pipe dreams. If we declare war on labour, as Tim Hudak would have us do and the Conservatives would choose to do, that, too, will make a difference in people’s lives. It will roll back the clock, and it will hurt Ontario families. Their cuts would devastate crucial public services—the health and education that take us so far in terms of our strong democracy. Their cuts would take us along a path to a low-wage, low-growth economy. That is not where we need to go in Ontario. So now is not the time for that kind of slashing that Tim Hudak is putting forward. I want to add one other important note. On a number of important issues, the interests of the people of Ontario are at odds with the policies of Stephen Harper’s government. Ontario workers want improved pensions for a more secure retirement. Stephen Harper will not act. Ontario contributes $11 billion more than it gets back from Ottawa, an important fiscal gap that needs to be addressed. Stephen Harper will not act on that. Ontario wants to develop its resources in the north. The federal government pours billions of dollars into the oil sands, but when it comes to the Ring of Fire, Stephen Harper has not acted. On these and other issues we need a premier who is willing to stand up to Stephen Harper, and then to stand against him if that’s what’s needed to promote and advance Ontario’s interests. That’s what I have done, and that’s what I pledge to do going forward. Tim Hudak shares Stephen Harper’s values, his ideals, and his approach. With so much in common I really believe that we have to question how that approach will get results for the people of Ontario. So the opposition parties have very different priorities than we do. They hold different values. As Liberals we have a clear vision, a sense of purpose, and a comprehensive plan. We will balance the budget by growing the economy, and we’re already doing that. We’ll ensure that people in all parts of the province share in the economic growth of the recovery; we’re already doing that. We’ll keep Ontario on track towards a success that we can sustain, and we’re already doing that. Over the past year, I have visited every corner of this province. I have met with CEOs; I’ve met with small business owners; I’ve heard the stories of families, and I’ve heard the stories of students, and their hopes. We believe in a province with a great history—we are a province with a great history—of accomplishment. What inspires me is what we can do going forward. In the coming weeks I look forward to meeting with many, many Ontarians. Across Ontario there is much to be optimistic about, but we have to be vigilant. We have to safeguard the advances that we’ve made and not put those at risk. We cannot take anything for granted. Liberals are committed to helping the people of Ontario move forward. I am committed to leading that, and I look very much forward to interacting with the people of Ontario between now and June 12.